This book gives you the best science-backed tools that you need as a busy parent to become your happiest self. This is a digital e-book only. After you order, you get instant access to download the e-book in your preferred format: Kindle, Nook, iBooks, or PDF for printing at home. To get your own paperback copy, visit Amazon. Get the Happy You, Happy Family book and start feeling happier today. 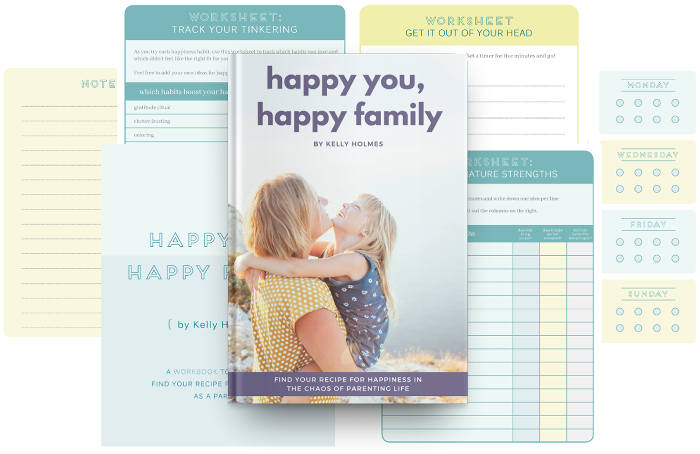 You'll also get a bonus workbook that includes printables to help you track your happiness journey and record your personal recipe, as well as access to a private Facebook community of your fellow parents where you'll get support and encouragement during your journey to find more happiness as a parent. For more information about the book, check out the FAQ. Important: After you order the book, you'll receive an email with download instructions. Please double-check your email address below to make sure it's correct so you get your book. If you run into issues, contact Kelly. Just what I was looking for! I learned the big things that I need to tackle , now I know the things that I need to keep working on. If you are looking for a game plan to help you shift yourself from a stressed mom to a happy mom, this book is for you! Read it, try it, improve… climb up that slope and regain control! Every mom needs to know how to care for herself in order to be a better mom. I found this book to be helpful, and a huge boost to who I am and what I am hoping to accomplish with and for my family. Love it! Purchased paperback edition on Amazon. Every Mom feeling overwhelmed should read this! Action steps are easy to follow! Happened upon this from her blog, love it so far, finding lots of good tips. I highly recommend this book to any Moms feeling overwhelmed and like we can’t get anything done. This book was very helpful and very easy to understand. She provides practical steps to follow and it has dramatically changed my parenting and lowered my stress level overall. So much helpful info I bought it for a friend! I like the assignment format of the book. Makes you commit to the work in order to get the results, which is why you bought the book!